Sources: “Crucified with Christ” by Herbert George Kramer S.M., P.J. Kenedy and Sons, 1949 and also the excellent book “She Wears a Crown of Thorns”, by Rev O.A. Boyer S.T.L Benzinger Brothers, 1949. 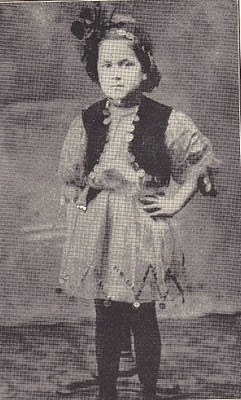 Marie Rose Ferron, affectionately known as “Little Rose”, was born on May 24th, 1902 in St Germain de Grantham, Quebec, and was the tenth child of a family of fifteen children. In 1906 when Rose was 4 ½ years old, her family moved to Fall River, Massachusetts. Then, on May 25, 1925 they moved once again to Woonsocket, Rhode Island where she remained the rest of her life. At the age of six, Rose had already had a vision of the Child Jesus. "I saw Him with a cross," she said, "and He was looking at me with sadness in His eyes." "Lord Jesus, when I reflect upon the words You have uttered, 'Many are called, but few are chosen,' I begin to tremble for those I love, and I beg You to look upon them with mercy: and behold, with infinite tenderness, You place their salvation in my hands, as it were; for everything is promised to him who knows how to suffer with You and for You. "My heart bleeds under the weight of affliction, but my will remains united to Yours, and I cry out to You: 'Lord, it is for them that I want to suffer!' 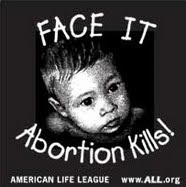 I want to mingle my tears with Your Blood for the salvation of those I love! You will not turn a deaf ear to my cry of sorrow and You will save them." 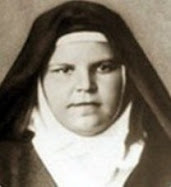 Even at a young age, Marie-Rose showed an unusual piety, devotion and a grasp of heavenly and spiritual things. It was not at all difficult for her for example, to listen to and follow a sermon just as a grown¬up does. And when Mass was over, she did not rush out to play, but preferred to remain at her place to prolong her thanksgiving. When Marie Rose reached thirteen, she became seriously ill as a result of carrying dinner to her father on a slushy early-spring day. Her right hand and her left foot now seemed paralyzed. Remarkably however, her hand was cured when she took holy water one morning after Mass two years later. In an instant it opened and once again she could freely move her fingers. But her foot never healed, and for twelve years she was unable to walk without crutches. Understandably, Rose saw herself destined to be handicapped for life, and thus a air of sadness and loneliness held sway over her girlhood. One summer morning, when she was seventeen, she felt her misery more acutely than usual. Writing about the occasion years later she recalled how she felt. It was a Sunday, and from her window she could see her sisters and their friends chattering and laughing as they left for church. "The life that overflowed from these girls, seemed to be the best that the world could give, and I contrasted myself with them. I felt crushed. I saw myself miserable, destitute and abandoned by God; I thought of my infirmity, of my crutches, I was heart-broken and I melted into tears." Another affliction that affected Rose deeply was her inability to attend school. "I felt as if I were blind, groping in the dark," she said. "I had nothing to look forward to, no hope of bettering my condition. I beheld my ignorance ever before my eyes, and that discouraged me more than my infirmities. Time, that softens everything, even sufferings, increased my own: they broke my heart." In 1922, the Bishop of Providence R.I., Reverend William Hickey, launched a million dollar campaign for the construction of several new high schools in his diocese. It was at a period that favored the raising of funds for such a worthy cause. But, although the bishop did not expect any collection to be endorsed in all quarters, he never surmised that this drive would meet a wave of bitter opposition from the ranks of the French-speaking Catholics, so traditionally loyal to the Church. They did not debate the validity of the drive. They questioned his right to assess their parishes, which already supported their own elementary French schools, even though the drive was for high schools. By 1924, a leader had arisen to crystallize the movement around a weekly newspaper called “La Sentinelle”. The paper spared no words in attacking the bishop, and its circulation grew. By 1927, its followers had become so obstinate that they refused all financial support to the Church. The bishop was now obliged to resort to drastic action. He ordered his priests to refuse the sacraments to all who persisted in their opposition and he was obliged to excommunicate the fifty-six leaders. At the height of the unhappy episode, the broken-hearted shepherd of the Providence diocese looked for someone to give him supernatural assistance. He knew he needed a victim soul to suffer for the division that was separating the flock entrusted to him. Knowing of her extraordinary piety and devotion, he chose Marie-Rose to make reparation for the dissenters and to spiritually assist him in bringing them back to the fold of Christ’s Church. And a victim soul was indeed Marie Rose mission. 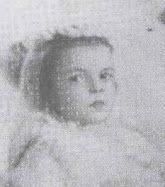 Marie Rose’s mother, Delima Mathieu Ferron, was of a rare virtue. 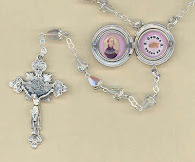 From her first pregnancy she had dedicated each of her newly-born children to a mystery of the Rosary and having fifteen children she had thus completed all fifteen decades. 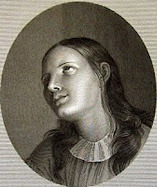 Marie-Rose, or simply Rose, as she was often called, was destined to be the child dedicated to the tenth mystery, the Crucifixion, and it was she whom Bishop Hickey called upon in his distress. 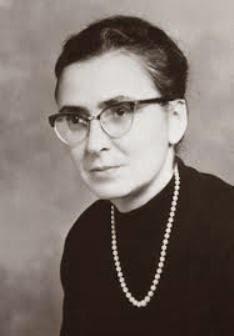 A few years before, Rose met a priest who taught her how to suffer and sacrifice out of love for God, so that by the time Bishop Hickey called on her, when she was twenty-five, she had completely accepted the mystery of suffering for herself, and could even say that she hungered and thirsted after it, and that suffering was to be her state of life. And, by this time she had been bed-ridden for five years. And so, the bishop called on the Ferron home because he knew he would meet there a victim who would be willing to offer herself as a living holocaust for his diocese. On her part, Rose recognized "a good heart" in the bishop. He felt so much at ease in her presence that all resistance broke down and he wept bitterly. "My child," he pleaded, "will you suffer for the Diocese of Providence, for its priests, and for those I was obliged to punish?" "I will do whatever you ask," answered Rose without hesitation. "I am willing to suffer as you wish and for the return of those you have excommunicated. I accept at once. It will be my mission to pray for their return." The bishop thought that Rose should reflect some time before complying with what might become a veritable martyrdom. He accordingly left the room for a few minutes, in order that she might consider the full import of her acceptance. When he came back, Rose reiterated her consent. Calm began to settle slowly over the Sentinelliste battlefield. Many thought it was the calm before a fresh storm. A lone victim was however obtaining graces for an entire diocese through unusual, mystical suffering. Once in ecstasy, she was heard to plead: "Take away my speech, if that will help. Take my eyes! Take my mind!" And with her eyes glistening with tears, she added: "Take everything I have and cherish. I am ready to suffer until the last one is converted, even one hundred years if You so wish it!" And later she said- "This affair will bear good fruit for both sides, and with Jesus I rejoice because of it." Remarkably, one by one, all fifty-six rebel children of the Church bowed in submission and obedience to their Bishop. One day, when Rose was twenty-two, the house was filled with the odor of freshly baked bread. Her younger sister, who was munching a crumb, invited her to have some: "Oh, Rose, it is delicious!" "I can't," answered Rose, who already knew the exigencies of her stomach. "If I do, I may die." "To die from eating or from hunger-what's the difference? Try at least." Rose tried and suffered as if she were actually to die. When all was over, her left hand was deformed. It was to remain crippled until her death. What is even more remarkable is that thereafter she partook of no more solid food. Rose herself attested to this fact, as did also her mother. For eleven years, until her death, Rose took only liquid food and even this she was at times unable to keep. 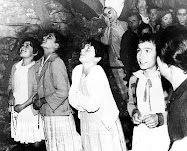 Realizing that she could receive Holy Communion, a priest once gave her some tiny unconsecrated particles. They promptly made her ill. 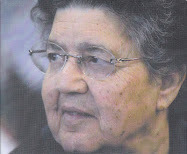 Moreover, four years before her death, she did not even drink water during a period of three months. But Rose felt hunger and thirst, as all who dwelt in contact with her very well knew. It was at the price of long and protracted craving for food that she was able to subsist on a diet that would have been insufficient for an ordinary person. "Little Rose," had begun her role of victim without foreseeing what type of suffering was in store for her, nor what unusual signs God was to work in her martyred body. Her abstinence from food and drink was only the beginning of many extraordinary mystical phenomena and of deep suffering. Throughout it all, she remained docile to authority, both medical and spiritual, and with delicate discretion tried ever to avoid publicity. 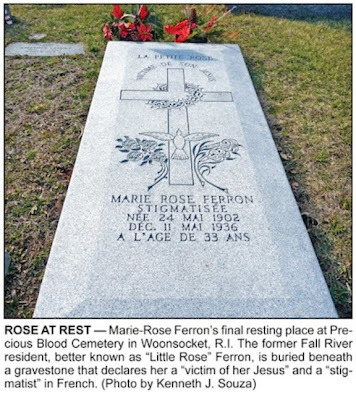 A detailed biography is not the object of this brief sketch of the life of Marie Rose Ferron. Her trials, her love for suffering, her stigmata and the content of her ecstasies and visions will be treated somewhat in detail, because they alone bring into relief her intimacy with Christ crucified. Other phenomena of her mystic life can be found in the excellent biography "She Wears a Crown of Thorns" by the Reverend O. A. Boyer. Suffice it to state here in passing that while in ecstasy she could not be lifted, even by 4 grown men, although she weighed not more than seventy-five pounds. Moreover, her body remained rigid, except when she spoke or wanted to use her hands while in conversation with Christ. Bishop Hickey authorized a private oratory next to Rose's room. When Mass was said there, especially on the feasts of the Blessed Virgin, Rose would drop into ecstasy at the opening prayers but she always revived at the moment of Communion. Generally, the instant she received the Sacred Host, her head fell back and she again drifted into ecstasy. Not the slightest movement of her throat muscles indicated that she was swallowing the Host, although It disappeared instantaneously. Many priests noted this fact, even one who did not to believe in the mystical authenticity of Rose's experiences. In fact, Rose's love for the Eucharist was intense. She had been accustomed to the daily reception of Communion, when suddenly it became impossible for her to communicate more than once a week. Rose suffered acutely from this isolation from her Eucharistic Lord. 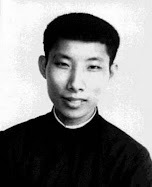 Once the priest was absent for two weeks. She was counting the days one by one until the Saturday when he was again to bring her the Blessed Sacrament, only to be told that morning that he was not coming. "When later she spoke of the incident," writes her biographer, "her eyes filled with tears and as they ran down her cheeks, the intense pain that they betrayed was revealed in her words. The words were simple and few, but they could move a dead man's bones. I am not sensitive, but this time I felt an acute pain all through me. . . . 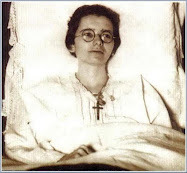 I shall never need a greater proof of the martyrdom that girl suffered when deprived of the Blessed Sacrament." When the priest learned that Rose lay constantly on a board to which she was tied, he was so profoundly impressed that he made arrangements for bringing her Holy Communion twice a week. During this same period, Rose became completely separated from the three priests from whom she had sought spiritual direction. Her isolation from them and the infrequency of the Eucharistic visits of her Spouse lasted several years. They were years of living by pure faith, amid deep sufferings, both physical and mental. For the remainder of her life, she was to wonder how she had been able to survive without having lost her mind. But she clung to the anchor of Faith and the Providence of God and found security in utter docility to her confessor's authority. 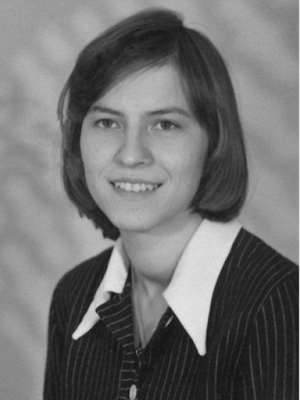 Rose Ferron was one of the most completely stigmatized persons on record. Whereas perhaps only thirty or so have borne the five wounds and the crowning of thorns, Rose had all of these, as well as the shoulder wound and the bleeding from the eyes. The wounds of Christ's scourging had appeared now and then during the latter part of 1926. But it was during Lent of 1927, a few months before Bishop Hickey sought in Rose a victim for his diocese, that these wounds began to appear regularly every Friday. The red and purple stripes were clearly visible on her arm, which seemed to have been lashed with whips. The wounds swelled and hurt like burns. Two days later, before the eyes of her biographer and another priest, the wounds of the nails appeared in her hands. Her feet too bore the marks of the nails. Rose had the sensation that her blood did not circulate beyond the stigmata in her feet, but the blood "streamed forth" from them. In describing the piercing of the muscles of her hands, Rose explained: "I feel them tearing apart; they seem to separate into shreds and to be drawn aside." "The blood gave a sweet-smelling odor unknown to me, somewhat like a perfume; my hands became saturated with it....It was not a transitory smell, since the odor persisted till the following morning." 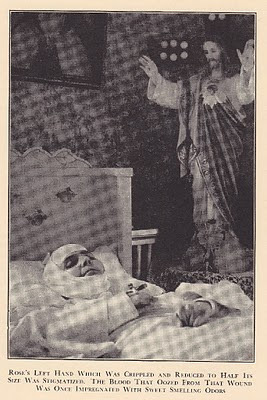 The stigmata of the heart began during the Lenten season of 1929. They brought such sharp pains to Rose that she sometimes fainted into unconsciousness. She said that the interior pain was "frightful." At times the pain was felt intensely in her back, "where the lance seems to have stopped. ", she said. Finally Rose suffered from the shoulder wound, which likewise brought her acute pain. The five wounds and the crown "came to stay," but the others appeared every Friday and disappeared on Saturday as rapidly as they had come, without leaving a trace. On Fridays, when the bleeding would begin, Mrs. Ferron would lock the doors of the house and would admit only a few visitors who had obtained special permission. Rose was embarrassed at feeling herself an object of study and would keep the stigmata under cover. Some of the visitors fainted upon seeing Rose in agony. Such incidents caused great annoyance to the bereaved mother. "It is hard to keep the people out," she once remarked, "but when they faint, it's far worse to nurse them back." The capacity for victim-suffering in this poor little Rose, crushed under foot as it were by her divine Gardener, was not yet filled. Like Him she had suffered from a scourging, from being pierced as if by nails, wounded in her heart, crowned with the piercing of thorns, and bruised on her shoulder. Yet had she to shed still more blood in order to fulfill her mission as victim in union with Him. But then, He had preceded her. Meek as a lamb, He Himself had been led to slaughter. In Him therefore Rose found strength. She found even love for the passion He was completing in her reduced body. As the story of pain unfolded with the months and the years, the realization that she was a victim grew more vivid. She knew that she was being tortured in the place of others and she accepted her vocation of bearing in her own body the physical pain spared them. In that, too, she resembled her Master, whose love prompted Him to bear mankind's punishment in its stead. "Dear Rose," a priest once asked her in a lapse during her Friday ecstasy, "you suffer so much! How is it that Jesus whom you love so much, as you told me yesterday, treats you in such a severe way?"" "The caresses of Heaven are not like those of earth," she said simply, and then fell back into ecstasy and "in indescribable suffering." And on another occasion Little Rose exclaimed "Oh Jesus, the happiness I have in loving You far outweighs the martyrdom that I endure". And in a letter to a friend Marie Rose wrote: "I will pray hard and my suffering will always be for souls," she vowed to a close friend. "I give myself to our dear Jesus to do with me Just as He pleases... I must ask you to pray for a very important intention. It is for souls, and at any price I must have these. They are so dear to God. Pray, pray, pray!" and again another time she said: "To save souls one should do anything. So together let us help Him, the One that we love, to give Him many souls!" "Tell Father Boyer that the night before last, for the first time, Rose's eyes bled and the blood dropped like tears." Thus spoke Rose's sister to a friend to whom she telephoned one day in August, 1929, referring to the most impressive, the most heart-rending, sufferings of Little Rose. In the same month, the physician attending Rose was overwhelmed with emotion at this sight and exclaimed to all present: "It is terrible! Believe all you see! She is a wonder." Rose was also bleeding profusely from her mouth at the time. Rose once asked of her mother and a couple of visitors near the bed: "How is it that I lose so much blood, when I have so little?" Hardly had she uttered this question when she lapsed into ecstasy and began to speak: "Oh! It is Your Blood that gushes from me! As for me, I am nothing, nothing, my Jesus!" 'No, certainly, don't fear,' he answered, and she removed her headdress to show him her head. . . He could not and did not want to speak to her. It was all he could do to tell me a few words.... This evening I returned at eight o'clock.
. . . She was worse than this morning. . .. Rose represents the Holy Face-it is the same thing!" A few days later, a gentleman who had visited Rose put his experience into writing: "I have never been so surprised in my life. 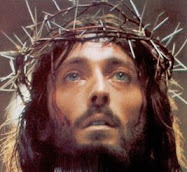 It was truly Christ's face, such as it is seen in the pictures of the Holy Face. Her face was covered with blood; a person could not see anything more pitiful. One feels like dropping on one's knees when seeing her." In June, 1930, the same man wrote again: "I was there last Saturday. She was in a frightening state; she had been like that since Friday. . .. I had never seen her like this before. There was so much blood on her face that one could not see the cavity of her eyes. All she could say was: 'My Jesus!' ... I cannot write about it without weeping. . .. I wanted my wife to see her in that state. So Sunday at about three o'clock, we went to see her. ... When we arrived, she was as beautiful as she could be, but very weak." There are various descriptions of Rose's sufferings on Fridays, during which the progress of the crucifixion could be followed. She would repeatedly ask the time, clearly awaiting the hour of deliverance. As three o'clock approached, she would begin to tremble and ask all to leave the room in order that she might be alone with her dying Savior. Father Boyer has described Rose's agony on a Friday of November, 1929: "At 11:00 A.M., the cavities of both eyes were filled to the brim .... The night before, I asked her why she did not wipe it away. She answered, 'By wiping it off, the skin is often taken along with it; but, if I leave it, the blood dries and scales off the following day.' And still by leaving it, she felt the blood burning, as though it were an acid." "Finally ... her chin dropped, her mouth remained open and the pallor of death suggested a corpse." "This sometimes took half an hour to perform and was accompanied with excruciating pains. Two weeks before her death I did this three times the same afternoon. . . . I never could understand how that girl could suffer so much!" "In July, I bled every day as on Friday. It was terrible! I felt that if the authorities were to do something, it was the time. I had no repugnance to being examined at the time and was willing to submit to the ordeal. But on the first of the month, the Friday on which I bled so regularly and for so long a time, on that very day, there was no trace of blood and even the wounds could hardly be seen. That day, Father called to tell me that I would be examined in two weeks. On seeing me, he said, 'What! Today, Friday, and there is nothing?' It's strange, but since then my wounds have not bled." Rose was pleased at the temporary relief afforded her parents, for their helplessness over their daughter's torments allowed them little peace of mind. 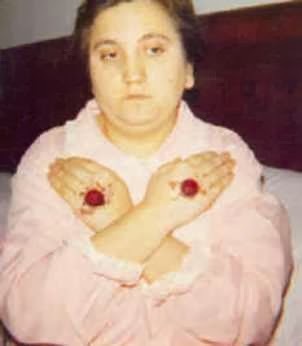 She had even asked her director if it were wrong for her to pray for the removal of all exterior signs of the stigmata. During an ecstasy she had prayed: "Oh my Jesus, I wish to suffer more and more, but spare my parents. Increase my sufferings, if You will, but allow no one to see them. Put a smile on my lips and a ray of Your glory in my eyes and show them that I am happy." Her sincere and humble prayer was answered. During her last five years on earth, she bore no stigmata, except those of the head. But her sufferings did not cease. Every Friday, the blood rushed to the members that had borne the wounds and caused even greater pain "than before. Rose wondered if she should not ask for the wounds to reappear, to which a priest replied, "God has brought them about and God has taken them away. If God wants their return, He can do so without being asked." The official medical investigation was never made. "I have had all kinds of doctors examine Rose," he averred, "and none of them can explain her case on natural grounds. To me her case is supernatural, because no one could have lost so much blood during the years and live." Referring to the very small quantities of liquid food which were her sole nourishment, he added, "She is sustained by God alone. I am thoroughly convinced the manifestations are supernatural." Equally valuable is the statement of one of Rose's physicians seven years after her death. Having in the meantime made a thorough study of Bremond, Tanquerey and other masters of mystical science, he stated in a letter composed at his own initiative, "Would that I had had the preparation when I treated Rose Ferron. 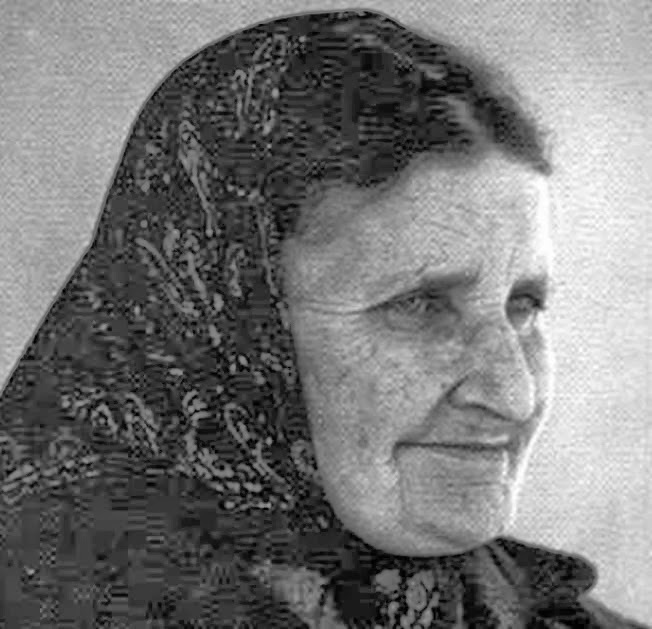 However, I feel honored when I think of the many phenomena I witnessed, and it is with pleasure that I now can affirm that Rose was a genuine mystic. I can see the stages she went through to the ultimate spiritual marriage and complete union with her Jesus. I now admire her complete abandonment to God and her simple humility. 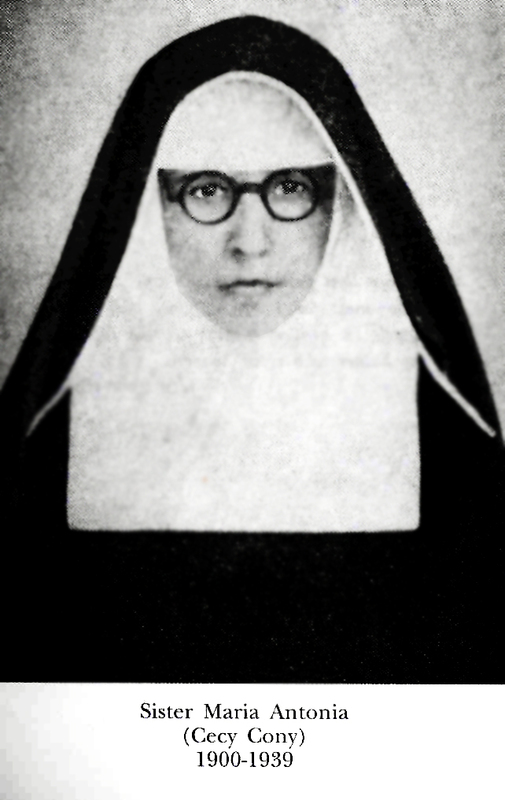 Her stigmata are ever fresh in my memory, as well as her great thirst for souls." The little victim of the diocese of Providence knew no more repose here below. Not only was her body and mind racked with pain, but she seems not to have slept for years, except perhaps when she would swoon into unconsciousness from sheer pain. From midnight until one o'clock, Rose kept her "Hour of Reparation." Then for three hours she busied herself as well as she could with her little crafts. She had learned to make book marks, to braid, and to repair rosaries. "I cannot remain idle," she once remarked. "My little Jesus wants me to work." And when someone questioned how she performed her tasks with but two fingers and her mouth, she replied, "My little Jesus comes and helps me." After four o'clock, she "dozed" for two hours. But Rose insisted that she did not sleep. In fact, she was aware of all that happened in the room. after year . . . ; I have seen the wounds she carried, the wounds which resembled the wounds of the crucified body of Christ. "On Friday, the wounds were more prominent and would always bleed. During the Lenten season, as Holy Week and Good Friday approached, her sufferings were much greater and the agony which she suffered at times was beyond human endurance and the bleeding during this period was much greater. "... I can say that she never complained, she always smiled, although in agony.... I have been blessed beyond expression by her friendship." Such patience is hardly conceivable in a stigmatist without deep-rooted humility. 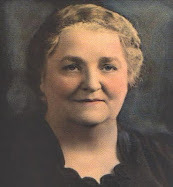 Rose's humility shone forth not only in her constant effort to avoid popularity and exhibition, but in many details of her life, as for example in her simple acceptance of complete poverty during the Depression, when her aging father had no work, when doctor bills could not be paid, and when she depended entirely upon public charity. Even in her ecstasies, she remained a little Rose. In one of them, our Lord seems to have proposed that He raise her to the honors of the altar, for she responded: "Be on the altars? I am too little for that!" Rose's humility, her reserve, her smile amid agony, "a smile full of frankness, a childlike smile which ravished one's heart," were so many tones vibrating into an ensemble of noble charm that was not unlike the attractiveness of Saint Therese of Lisieux, the Little Flower. 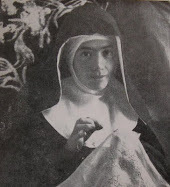 In fact, a priest, who had lived in Lisieux and as a boy had known the Carmelite saint, testified that "Rose has not only the physical resemblance of the Little Flower, but she has also her power of attraction; when we are with Rose, we don't know when to leave and when we are gone our hearts irresistibly cling to her memory. That is why the Little Flower influenced me and all the children of my age who visited the Carmel. Her personality impressed us so that she seemed to follow us wherever we went.... During and after my visits with Rose, I went through the same experience as I did years ago when I visited the Little Flower. She inspired me with the same confidence and I really have the same veneration for both of them." 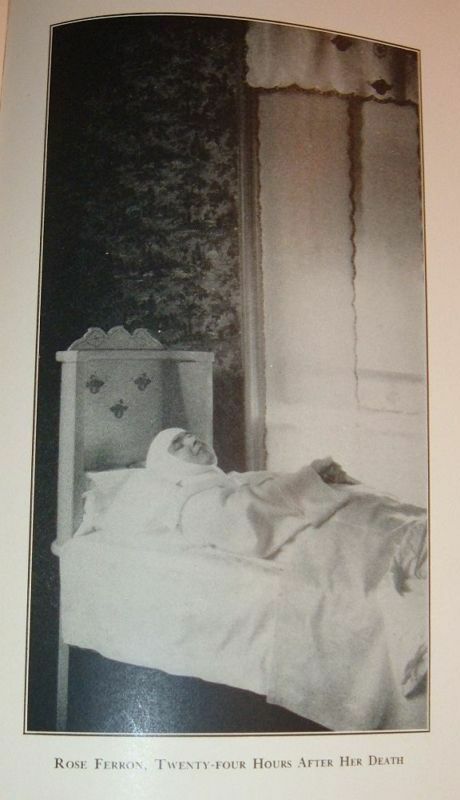 Many visitors to Rose's home shared this priest's impression. If some came out of mere curiosity to see her sufferings, still more came to meet "a soul of crystal" in which they perceived the most beaming reflections of the supernatural they had ever encountered. They loved hearing her speak because of the mingled serenity and abundance of heart that filtered through her words. While she was in ecstasy, her prayers aroused in the bystanders deep emotions of contact with the supernatural. This crippled girl, who had formerly felt herself an outcast because she had no education, expressed her thoughts with a careful apropos that astonished visitors. Her constant and intimate union with God had supplied whatever human education had failed to furnish her. However as with all mystics, her lot was not without its brunt of calumny, gossip, and ridicule. But she was too generous of heart to retaliate. "Even were I to try to hate and blame those who work against me, I could not do it," she explained. "It seems that I love them still more; and I have a desire to pray for them." The true explanation of Rose's tenderness towards others, even those who slandered her, was her tremendous love of God. "0h Jesus, the happiness I have in loving You outweighs the martyrdom that I endure," she once exclaimed. 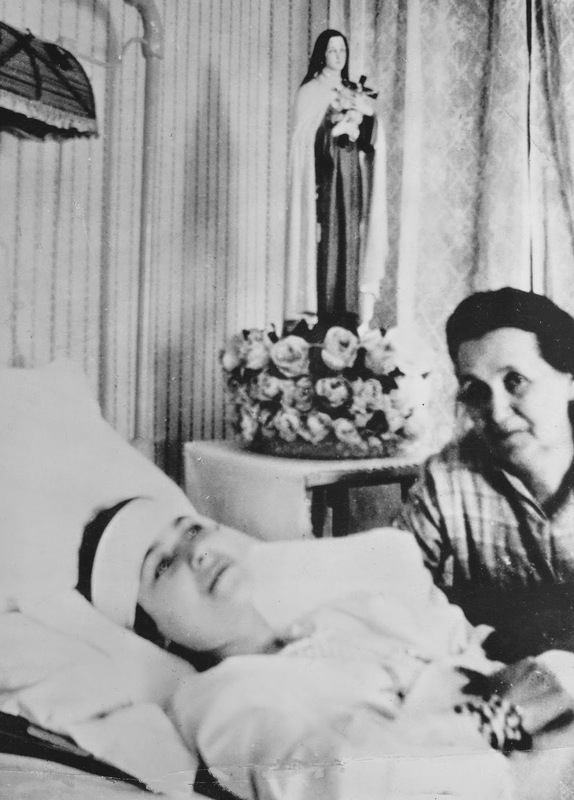 Little Rose was joyful amidst her sufferings, and she was radiant in the intimacy with her Divine Spouse. "How sweet it is to rest at Your side, 0 my Jesus!" she repeated during an ecstasy in 1934. "You know that I love You!" and I want without a cloud to love You more than myself. Oh! It is for You, my Jesus, that I wish to suffer. for that would be my heavenly Father's will." 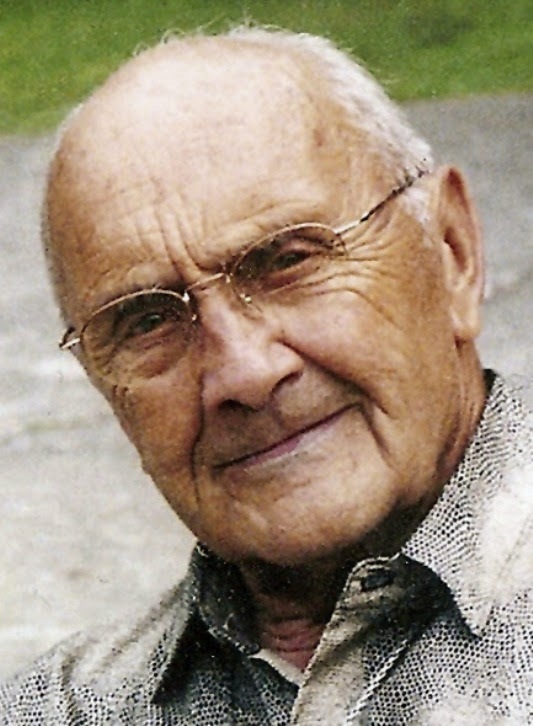 This lifelong love for Christ in suffering led Rose instinctively to prefer devotions that honored His Passion. The month of the Precious Blood was for her, who had bled so much in her own victimized body, replete with inspiration. "It would take so many lives like mine and others," she said admiringly, "to make up for just one precious drop of His Blood." Rose's preference among pictures and statues of Christ was definitely for those that depicted Him in suffering. She loved above all a statue of the Scourging, because it held graphically before her eyes the price of wounds and blood that the Man of Sorrows had paid to redeem mankind. Blessed Brother Andre Besette, the Brother of the Congregation of the Holy Cross who radiated sanctity far and wide from his porter's room at Saint Joseph's Oratory in Montreal, Canada, was likewise impressed by this statue on a visit he paid to Rose in 1931. For twenty minutes he studied it thoughtfully. That evening he expressed to a friend his desire to have a statue just like it. When Rose heard of it, she reflected in prayer over Brother Andre's wishes. "If giving my statue to Frere Andre would give Jesus more souls, why should His Little Rose not make the big sacrifice?" she concluded. On the Brother's next visit, Rose made "the big sacrifice." 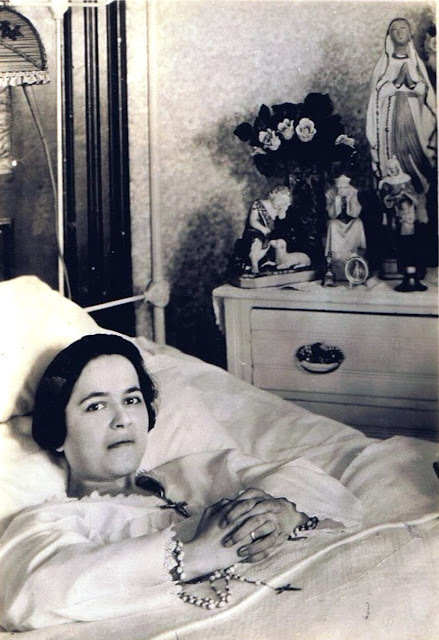 While in ecstasy on April 13, 1929, in the presence of six visitors, Rose asked her Saviour how long she had still to suffer, and then she repeated aloud the answer, "Seven years!" She began to count the age she would have after seven more years, and stopped at thirty-three. Christ seemed to ask her if that were too long, for she said with great eagerness: "Oh, no! Come and get me whenever You want. I am ready to suffer one hundred years, if You want it. It is my sacrifice to stay." As was revealed to her previously, Marie-Rose Ferron died in 1936 at the age of thirty-three. Death alone released her from the suffering that pursued her day after day. "God and the victims are the only ones who know what is meant by the word 'Cross,' " she had remarked, and her last two weeks were filled with the overwhelming realization of the truth of this statement. Rose could no longer see. 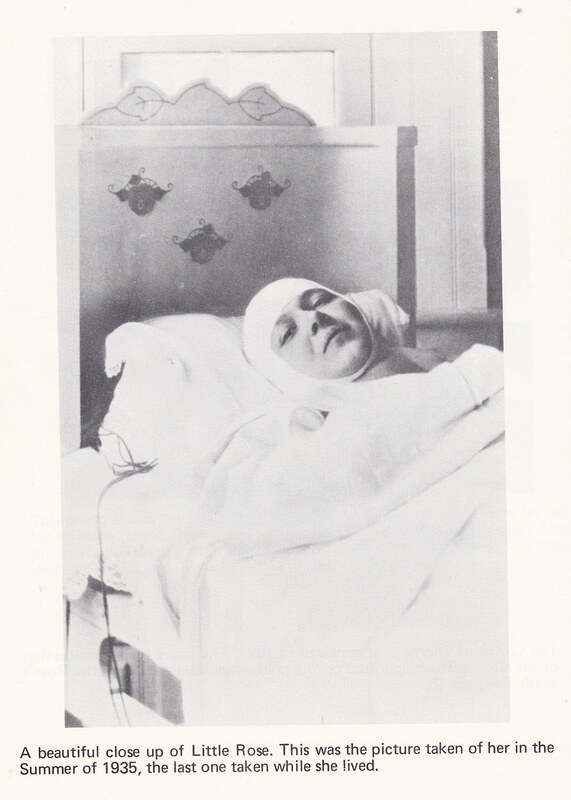 She suffered such pains in her head that the least sound was like a blow, and any noise caused her to faint. 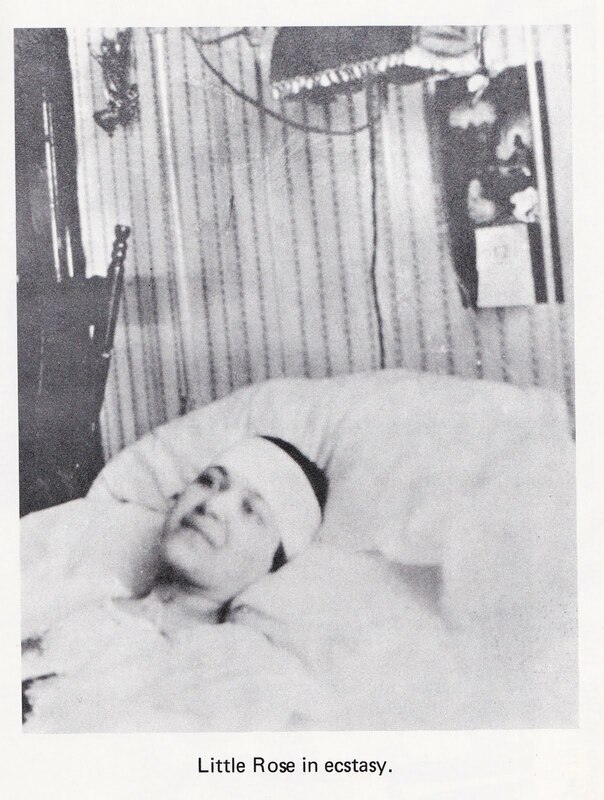 On the last day of April, 1936, she lost her hearing and speech completely. There was no way of knowing what she wanted. 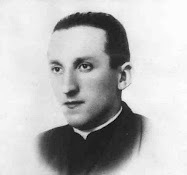 On May 6, Father Boyer called at one o'clock in the morning. "I walked into the room," he wrote in his biography, "and when I saw the condition in which she was, I was moved with pity. I could not recognize her, she was so changed; her face was not only disfigured, but wrenched out of shape. Her eyes were half-closed and in their corners thick blood was gathering; her complexion was copper red and her skin appeared coarse and swollen; her breathing was painful; her mouth was open and twisted with a heart-rending expression. She was like a dying crucifix, waiting for the consummation of her martyrdom." Rose lived five more days. In death she still had "the expression of anguish embedded in her face." But as the women, whom she herself had appointed for preparing her body for the coffin, were washing her face, its frightful distortions disappeared. A change came over her features at each stroke of the towel. Her countenance emerged wreathed with a charming smile. She was so natural that a doctor was called specifically to ascertain her death. In fact, Little Rose's beauty had long impressed her visitors. In their testimonials of her phenomena, they repeatedly commented upon it. When they saw her writhing and bleeding in the atrocious sufferings of the Passion, they failed to note the beauty of her features. "Yesterday she was so beautiful," wrote one priest, "today she is covered with blood." Surely it was the inner beauty of her virtues that radiated in her external countenance. "There are things one can never forget; for us it is the radiant face of Rose Ferron. She was beautiful, but hers was not a natural beauty, but rather a mystifying one: a slight luminous emanation seemed to escape continually from that angelic face." This author joins the many others worldwide who fervently hope and pray that "Little Rose" may soon be canonized by the Catholic church. 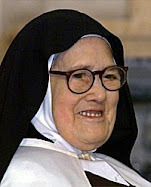 ~Marie Rose Ferron, pray for us! For more information about Marie-Rose Ferron, see the excellent two part article: "Marie Rose Ferron -An American Mystic and Stigmatic" and for more photos see Marie Rose Ferron -A Photo Documentary"
Also, for those interested, I have just republished a booklet that was originally published by "Little Rose Friends" back exactly 50 years ago (1964). 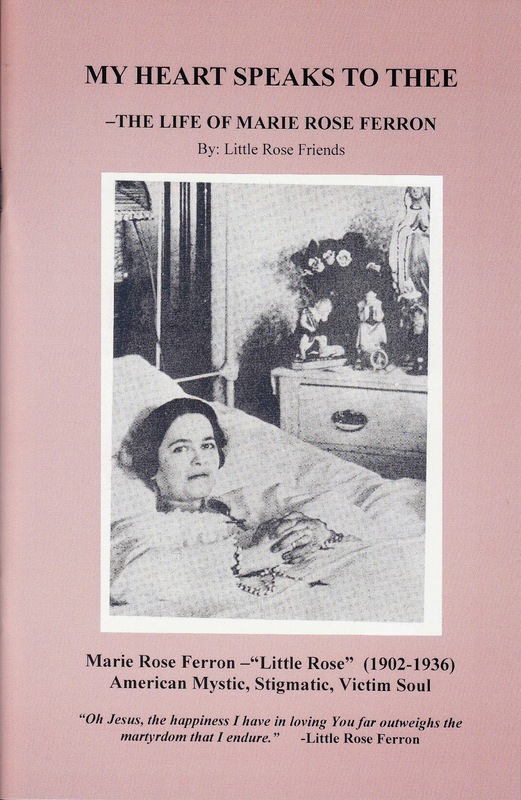 The booklet is entitled "MY HEART SPEAKS TO THEE -The life of Marie Rose Ferron"
The booklet has both an NIHIL OBSTAT and also an IMPRIMATUR from the first edition in 1964. This new 2nd edition contains 7 additional photographs of Little Rose and included with each booklet is a free Little Rose holy prayer card with a photo of Little Rose on the front, and some sayings of hers on the back. -Both for only $5.99, plus $2.99 shipping. Amen! Viva Cristo Rey! Jesus is Reedemer and He testifies His redemption efforts through love and His elects! 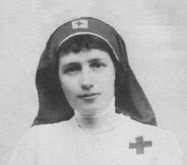 May Rose will eventually be canonised and become a venerated Saint. Viva Cristo Rey! Viva Cristo Rey! Viva Cristo Rey! Marie Rose Ferron redeemed our father Stephen Odell Dean of Alcohal addiction thru her sufferings. Our mother and Aunt went to Canada and got holy water that was toched to Mother Rose.They brought it back to N Fall N.Y gave it to father to drink. from that time onward completely sober. Glory to the Father and to the Son and to the Holy Spirit Thank You Rose Ferron I witnesssed this miracle. Iwas 16 years old. I am now 80 yrs old. Thanks for this fascinating story! Just an update, Brother Andre Besette is now a Saint. **SUNDAY, MAY 20 AT 8:30AM AT PRECIOUS BLOOD CHURCH, Woonsocket. *AND ALSO 5:00 PM AT PRECIOUS BLOOD CHURCH, ALSO ON MAY 24. *We are encouraging that the devotees would attend the Mass at the Precious Blood church, on Carrington ave and Corner of Park Ave in Woonsocket on May 20th Sunday, and also the one on May 24 at 5:00 in the evening. We encourage devotees to have a mass said in memory of Little Rose in their parishes during May or during the summer Sundays if possible. For those who live in the surrounding areas of Woonsocket, we ask that you have a mass offered for Little Rose in other Churches in Woonsocket and the surrounding Churches of Woonsocket . Our Lord has given to all of us the privilege of offering the Sacrifice of the Mass for one of His Chosen Victim Souls-a Victim Soul that has offered herself for her own Diocese since 1925 and continues to the present. 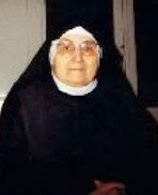 Truly Marie Rose Ferron is a Martyr of Charity- let us grow in her example of her heroic sanctity and virtues. May 26, 2013- 8:30 a.m.- Precious Blood Catholic Church, Woonsocket, RI. May 26, 2013- Our Lady of Good Help in Mapleville, RI. --10:30a.m. @Dominic George - Que viva! I'd love to know her address where she lived in Fall River Mass. Rose is my mothers cousin, mom is now in a nursing home, I never really believed this till now, mom was born 1 11 1916 , name was Alice Belenger Her mom was emma Ferron Belanger, She has a copy of very old paper there, as I found in her things , she told me of this , but I thought it was a fairy tale, So proud ta see not .She would love ta see this . Yes she has had the hardest life. But never complains. and she is in Longmeadow of Taunton Ma. 02780 Now Alice Belanger Lacombe. I'm from Boston, Ma. I'm 35 years old. I feel intimately attached to Rose Ferron because if it wasn't for her intersession I wouldn't be here. Rose Ferron saved my father's life! You see, my father's mother and my great aunts were very close with Rose Ferron's family. As children my parents and grandmother used to take us to Rose Ferron's house for prayer vigils which if I remember correctly were held by Little Rose's sister. When my father went to Vietnam my grandmother gave him a relic of Little Rose which was given to her by Rose's sister to take with him and prayed to Little Rose that through her intersession he would be kept safe. It was on his person at all times. He pinned it to the inside of his pocket until one day he lost this relic. My father went crazy. He searched for it for a month. He turned out all his pockets, emptied out all his trunks, bags, shook out all his blankets and bedding. Over the course of that time he continued looking, searching everything he had several times. One day during a mission a vietnamese soldier jumped out and shot my father repeatedly, emptying out the whole magazine of his gun into my fathers body. He should have been dead. The soldier turned my father into a human piece of swiss cheese. He woke up a week later in a hospital bed. After he awoke one of the people who had been caring for him came over to him with the relic in their hand and told him they had found it embedded in the wound closest to his heart. Our family believes it was a miracle that was granted through the intersession of Rose Ferron. If he had died that day (and he should have!) my sister and I never would have been born. Thanks so much for sharing the awesome story concerning the miraculous intercession of Marie Rose Ferron in your fathers life. What an exceptional grace that your dad received! 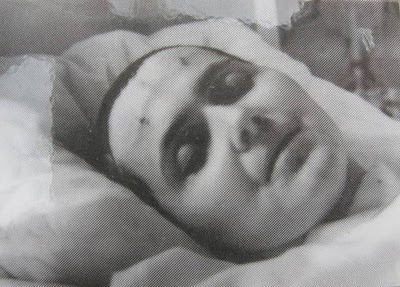 Marie-Rose Ferron, pray for us. one day soon i will visit her grave. please pray for me that i may have poupose and meaning in my life. 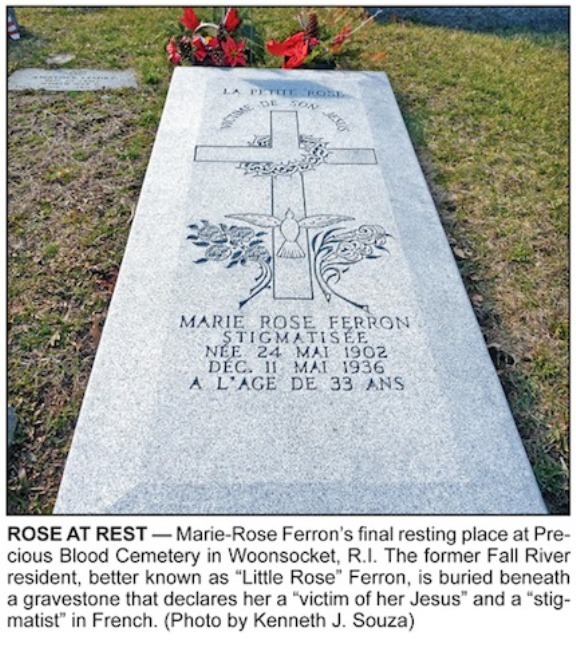 I am very happy to read about the life, suffering and death of Marie Rose Ferron. She endured all with humility and Joy, she never complained. Oh my Jesus suffered sooo much for us. Marie Rose Ferron please pray to Jesus for me that I my live a holy life with humility and purity, be useful in life for God and men on earth. 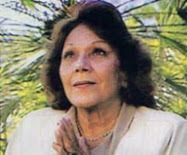 Marie Rose Ferron, pray for me! Truly an amazing story full of heartache and whoa. To be so beautiful a person is inspiring. So much suffering in the World today in the Middle East and beyond and yet this does not seem as much as Little Rose suffered for Christ and thus for us. May we love Christ as much as she and the Blessed Mother and other mystics and Saints if only He would let us, if possible.. Help me, Little Rose, to come to the Lord with more purpose for this life so that I may worship Him after in Heaven for eternity. May I always be a Child of Christ and Mary. I guess my question is the work is done why do we need to suffer? I have been through some extrodinary events, again why do we suffer if Christs work is completed? I'm wanting knowledge? In short, while Jesus obtained for us the possibility of our salvation, the work of conversion and redemption is ongoing. I hope this helps to answer your question. The Gospels are insufficient at describing the sufferings and indignities that Jesus endured for our sins to restore the broken friendship with GOD the Father Holy Trinity. Very blessed to read this! I am curious about one thing: she had so many siblings, each one dedicated to a part of the Rosary + what became of them??? Hi that's amazing thing. I hope you Are good now. I was reading your comment after reading the life of Rose. I hope you are doing well and wish you good health too. Wow! That is so amazing story about your father. God bless you. Thank you for posting this article about our little saint from Rhode Island. What is amazing is how many people in RI still don't know about her! I highly recommend the books you've listed about her. They document her remarkable sanctity and supernatural life yet gets little notice. I hope you get special graces for spreading the word Glenn.